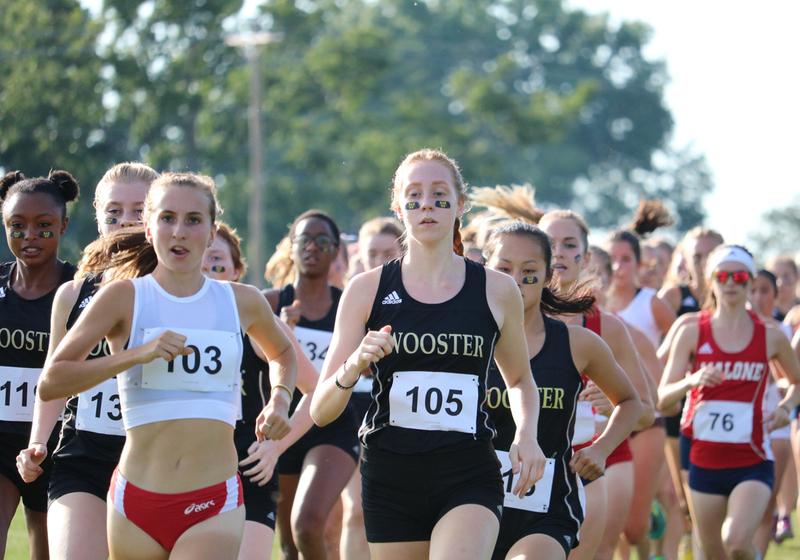 The College of Wooster men’s and women’s cross country teams put together strong performances in the season opening meet at the L.C. Boles Memorial Golf Course on Aug. 31. Both teams featured several star first-years, with the women’s team having 10 new recruits, and the men’s team four. The men’s course was four miles, while the women had 2.5-miles. Going into the race, Grant Sprague ’22 was asked about his thoughts on the team this season. “It’s a great group of guys. I really like them,” he said. He also mentioned how his teammates push him to be his best. Joe Henry ’22 shared his expectations for the season as well. “I hope we can go as far as possible and beat as many teams as possible. That’s always a goal in my mind,” Henry said. He added that he knows running cross country in college means a lot more mileage weekly, but that has been something that has kept challenging him. The transition from high school to college can be difficult for many, but Henry says running cross country has helped him ease the shift. On the men’s side, the veteran trio of Jackson Feinknopf ’19, Brian Lief ’19 and David Westcott ’19 all placed within the top four out of the Division III runners. Westcott crossed the finish line first for Wooster with a time of 21:39.8, finishing seventh after only Division II runners from Malone University. Feinknopf covered the hilly, four-mile course in a time of 21:45.2, good for a ninth-place finish. Lief finished third for Wooster and 13th overall with a time of 22:13.7. Miki Rae ’20 crossed the line in 22:20.3, good for a top-15 finish. On the women’s side, Co-captain Emani Kelley ’19 finished the 2.5-mile race in a time of 15:50.4, placing ninth overall in the field. Collier Summay ’19, the Co-captain, crossed the finish line in 16:23 for a 17th place overall finish. Kayla Bertholf ’22 and Isabelle Hoover ’22 impressed, both finishing between the two captains. Bertholf finished in 10th place with a time of 15:52.3, and Hoover finished in 15:58.3 for a 12th place finish. After the race, Will McMichael ’22, who has always been a 400-meter runner in track, said that the course was one of the most challenging he has ever faced: “On the downs you feel good, and of course on the ups it’s a real struggle. But, I think that one of the most difficult things about this course and this race for me was the big gaps between runners. Being alone while running a race and not having someone to push you or work up to is a tough mental game to play by yourself.” He added that he hopes the team continues to form a solid pack up in front during races so that everyone can push each other. Next up, Wooster will be racing in the Otterbein University Invitational on Sept. 15th. Go Scots!